IBP-1404 supports fours video channels and IBP-1408 supports eight video channels. With the State-of-the-art software video compression technique. It can a resolution of 704x480. The built-in voice chips record voice data at the same speed with video recording. These Features: guarantees the quality of recorded images and sound in playback to be "what you see/hear and what you get" performance. 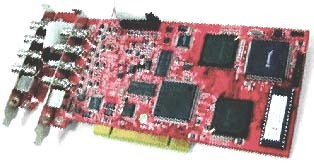 4 video channels, 4 audio channels, MPEG-4 H/W compression on-chip, PCI bus. 8 video channels, 8 audio channels, MPEG-4 H/W compression on-chip, PCI bus. SDK-140X - Software Development Kit is available to customize your own DVR applications. Please contact us for the SDK.